The confetti from Super Bowl celebrations hasn’t even been swept up yet, and already Major League Baseball is here to remind you that the first pitch of the 2014 season is right around the corner. And when those games do get underway, you’ll be able to watch them on more devices than you did last year. On Tuesday, Major League Baseball Advanced Media began taking subscriptions for the 2014 season of MLB.TV. Baseball’s streaming service broadcasts every out-of-market regular season game live to a slew of devices, including computers, smartphones, tablets, set-top boxes, and gaming consoles. Baseball fans have found the video service to be a great way to always stay close to the on-the-field action, particularly if they live in a different city than their favorite team. And starting with the 2014 season, MLB.TV will offer new ways to stay connected. The service is adding support for both the Xbox One and PlayStation 4, the new gaming consoles that came out late last year from Microsoft and Sony, respectively. It’s hardly a shocking announcement—MLB.TV was previously available on Xbox 360 and PlayStation 3 consoles, and an MLB spokesman told me that last-generation console owners will still be able to watch games on those older devices in the coming season if they subscribe to MLB.TV Premium. The $130 MLB.TV Premium offering includes a free version of MLB At.Bat, the mobile app for watching games on your smartphone or tablet, as well as the ability to watch on connected devices like gaming consoles, the Apple TV, Roku, and a host of other options. Premium subscribers can also pick between home and away feeds of games, in case you find one particular play-by-play announcer to be too much of a homer for your tastes. (Not that I’m referring to you specifically, Hawk Harrelson.) 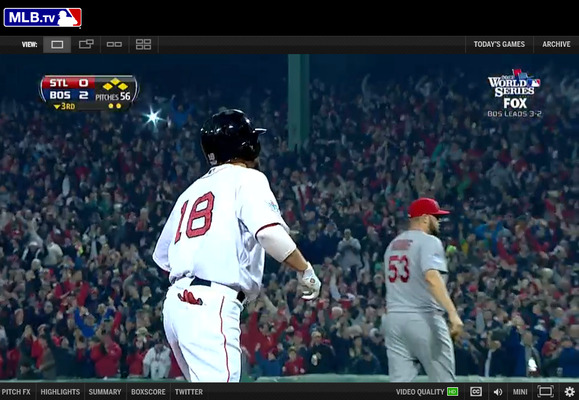 There’s also a $110 MLB.TV subscription, but it lacks the portability features that Premium users enjoy. MLB.TV plans to add other features this season, though details weren’t available Tuesday. In seasons past, Major League Baseball’s digital media arm reveals new features closer to Opening Day. Baseball season begins on March 22 with an overseas series between the Arizona Diamondbacks and Los Angeles Dodgers from Sydney, Australia. The games begin back home on March 30. But MLB.TV subscribers will have plenty to enjoy before then—the streaming service will provide access to more than 200 live spring training games starting on February 26.